As Calcutta was to the British Empire, so the tiny and distant island of Ambon was to the Dutch. The Dutch East India Company (VOC) made this the base of its administration and favoured the Ambonese in their civil service due to the island's proximity to the source of the all-important spices - principally nutmeg, cloves and pepper. Today the Maluku islands have started to sink into obscurity and relative economic decline. Decaying Dutch forts still cling to the mangrove-covered coastline, these days attacked by overwhelming humidity and disinterest rather than fierce tribal warriors or the gunboats of competing colonial powers. Then, a century of mostly peaceful obscurity was shattered with the outbreak of sectarian conflict between Maluku's Christian and Muslim populations in 1999, taking most observers and the government by surprise. Centred on Ambon Island, 3 years of blood letting led to over 5000 deaths and around 500,000 people becoming displaced. Since the return of calm to the islands, destroyed homes and offices, churches and mosques have been either torn down or renovated. 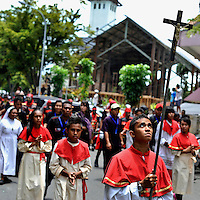 Urban centres, such as Ambon City, continue to be split along largely sectarian lines and tensions are never far below the surface as was proven by riots which broke out between Christian and Muslim youths in September 2011 and June 2012. These were relatively quickly brought under control by community leaders all too aware of the costs of an earlier, much larger conflagration.